Shrink wrapping is a very popular type of package sealing technology because at minimal cost and with very little difficulty one can wrap packages with even a multitude of irregular contoured surfaces, tightly and securely. The two machines you see above are among the most popular type in use today. The machine on the left is an L Bar type sealer and the one on the right is a case wrapper. Both of these are made by Weldotron, and I had to fix the electrics on both of these. The L Bar sealer is made for sealing the stretch wrap around an item like a loose fitting bag with heat welded seam on 3 sides. The product is slid into a U shaped section of stretch wrap and the placed in the seal zone. The L Bar assembly is bought down on the wrap and electric heat seal bands energize to simultaneously seal and cut the film. The product inside the loosely fitting bag is then passed through a shrink tunnel where the heat shrinks the film around the item to give it a nice looking tight wrinkle free fit. A typical example of a product wrapped in this manner is the software boxes you see in the computer stores. The case wrapper is fully automatic. 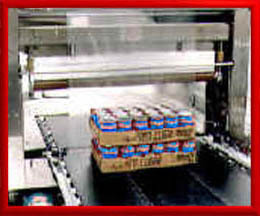 A cases or stack cases are placed on a motorized infeed conveyor. The cases are propelled forward through a curtain wall of solid plastic wrap material. As the case moves forward the plastic wraps itself around the cases forming a horizontal U shaped sleeve. Once the cases pass all the way into the machine a combination horizontal seal bar and cut off knife assembly descends upon the plastic wrap. First the heat seal bar creates two seals. One behind the case to create the O shaped plastic sleeve around the cases and another one just behind the case to fuse the plastic into a second joined seam. Then a cutoff knife of hest wire in between the two seals activates. The cases now travel forward into the heat shrink tunnel and the second seam joins the top and bottom edges of the plastic to form a new curtain wall of plastic to receive and wrap around the next case. Packaging machines are so much fun to watch in action especially after I repair them that sometimes I feel like a kid that has just built something great with his giant Lego set.